It might seem strange to use the name « bird » to describe an animal that spends half its life on land (often frozen we will get back to this) and half in the oceans, but are never in the sky because they are perfectly incapable of flying ! And yet, the penguin is certainly a bird, a migratory bird moreover, who has had to adapt to the oceanic environment of the southern hemisphere of our planet, where he lives. Sometimes faced with extreme climactic conditions, certain species of penguin have developed an impressive resistance to the cold and can handle temperatures as low as 50 degrees below zero ! The penguin is a sociable animal that forms groups when on land and may form colonies of up to several thousand members. Penguins have a body that is ideally adapted to swimming and diving ; they do not fly through the air but instead « fly » gracefully under water. Suitably, they have small rigid and flat wings, a long body and a head with a long beak. They have two webbed feet which allow them to walk « upright » in addition to a short and squarish tail. Their bodies are covered by longish, small feathers which are densely packed as to prevent water from coming in contact with their skin. The size of penguins varies in relation to the 18 different subspecies ; as such, a Little Blue Penguin may be as small as 40 centimetres long and weigh 1.5 kilos, whereas Emperor Penguins may be as long as 1.30 metres, and weigh almost 40 kilos. Each subspecies of penguin has particular features, with respect to the head, the form of the beak which is adapted to a specific diet, eye colour (yellow, red or blue ) or the plumage (black back and white belly). However, more generally speaking, penguins' vision and sense of smell are very developed and their tongue is very rough and strong. 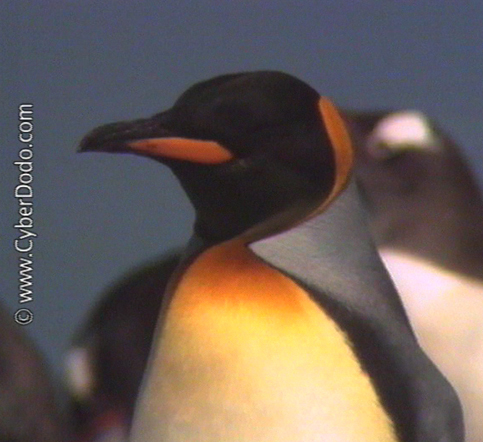 We also know that the penguin perceives colours and is sensitive to blue, green and purple, although it seems that when not underwater, the penguin's vision becomes blurry.